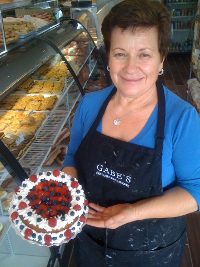 GABE'S was originally opened as Caledon East Home Bakery in May, 2001. Having lived in Caledon, Gabe and Anna, the mother and son duo, saw a need for fresh baked goods and delicious meals. "At the time I had no experience at all. My mother, on the other hand, had always worked in bakeries," recalls Gabe. Today the bakery is still proudly owned by Gabe and Anna. They work together to fuse traditional Italian food with modern cuisine.